A $3.5 million gift from the Jud Ammons family, of Raleigh, N.C., in honor of his late wife Meredith College alumna Jo Ellen Ammons, will renovate the iconic Johnson Hall and add an exciting new welcome center to the facility. The Jo Ellen Ammons Welcome Center will house admissions, financial assistance, the registrar, and the business office and create a more user-friendly experience for prospective and current students and their families. 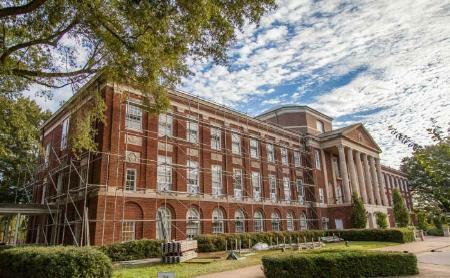 "The renovation will create a better experience for all who come in contact with Meredith and allow the College to make needed repairs," said President Jo Allen. "We are so pleased that Jo Ellen's family has given this gift in her honor, expressly reflecting her own singular purpose of doing anything that would help us recruit top students." The renovations include building the Welcome Center, restoring the historic elements of the building, adding a new copper dome, and moving the staircase to create a view from the front entrance through the Rotunda into the courtyard. Renovations are expected to be completed by summer 2016. Ammons earned a degree in religion from Meredith in 1957 and served four terms on the Board of Trustees. She was involved in numerous initiatives over the years and was the recipient of the Meredith College Alumnae Philanthropy Award in 1997. "Jo Ellen's greatest interest was students," said Jud Ammons, Jo Ellen's husband of 57 years. "She was compassionate, hard-working, and always smiling. She loved Meredith and was always interested in helping people." Ammons says this gift is a perfect way to honor his wife because she was such a welcoming person to all who met her. This gift is part of Meredith's Beyond Strong campaign, which is building momentum toward the College's 125th anniversary in 2016. The campaign supports six priorities identified through the College's strategic plan: educational excellence, optimal enrollment, enhanced financial strength, cutting edge facilities and technology, greater visibility, and enhanced quality of life. "In my professional life I have been involved in four major campaigns, and CapDev is 'head and shoulders' above any consultant or consulting company I have ever worked with. For my organization, CapDev was professional and very thorough in an internal Campaign Readiness Study and a Campaign Feasibility Study. Michelle Schneider is not only a trusted advisor but I feel like she is a member of my staff."